a medium sized potato contains only 100 calories. an excellent source of fiber when eaten with the skin. How do I get my kids to eat potatoes? can make their own loaded baked potatoes. What is the best way to store fresh potatoes? What do you look for when buying fresh potatoes? I've found brown spots or hollow areas in some of my potatoes. Are they rotten? Can I still use them? not affect the taste or use of the potato. Why do potatoes turn green? Should I peel away the green area before using? process is completely safe and occurs in all plants. How long have Kitchen Kleen Potatoes been around? in 1929 in the fertile northern Wisconsin soil. From a plot meant to feed a family, Barron West's five-acre dream has grown into a 5,000-acre family-owned business that has harvested enough prime Russets to reach the moon and back over 25 times. Where are Kitchen Kleen Potatoes grown? Nuto Farms, local grower of Kitchen Kleen Potatoes is set in the rural community of Rice Lake, where it has created a strong and solid reputation as being a premier local grower and shipper in the potato industry. Nuto Farms location in Northern Wisconsin was no accident. The mild daytime temperatures and cool nights produce a quality potato that is high in dry matter and low in water content. A potato that really does store well and taste great. What variety of potato is Kitchen Kleen? 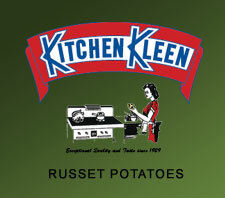 Kitchen Kleen Potatoes are prime Russet Burbank potatoes. While Russet Burbank potatoes are hard to grow, they are a high quality potato that tastes great! For more information on potato varieties - check out our Potato Varieties page. shelves for the summer and return again in October. Our customers, like you, have come to rely on Kitchen Kleen Potatoes for their great taste and consistent quality, we won’t sacrifice quality by storing potatoes year round or by using a poorer quality variety. Our availability may be shorter, but that is to ensure the freshness of our potatoes and the potatoes speak for themselves. With Kitchen Kleen Potatoes, you really can taste the difference. Kitchen Kleen Potatoes are also certified Environmentally Grown by the Midwest Food Alliance. Where are Kitchen Kleen Potatoes sold? Kitchen Kleen Potatoes are sold October to June each year at preferred grocers in the Upper Midwest. Ask your fresh produce manager for Kitchen Kleen Potatoes or visit Nuto Farms in Rice Lake mid Oct. - June. Kitchen Kleen Potatoes are certified "Environmentally Grown" by the Midwest Food Alliance, a non-profit organization that provides third-party approval of farms that grow food in environmentally and socially responsible ways, Midwest Food Alliance.